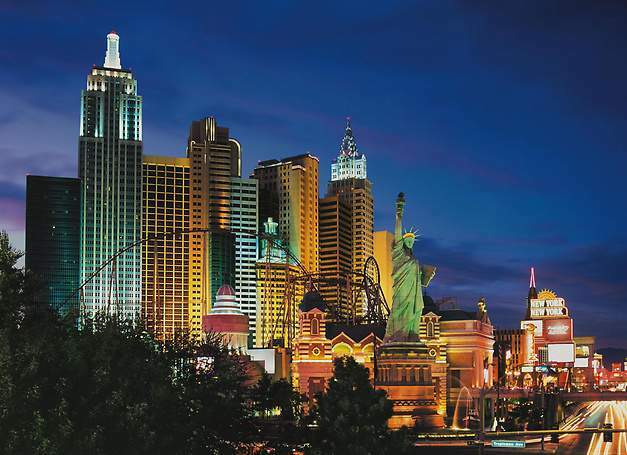 New York New York Hotel Las Vegas will remind you of being in Greenwich Village and Time Square. Every nook and cranny of this property is fashioned after iconic neighborhoods and sites that you would find in New York City. The atmosphere is even enhanced by the roar of the Big Apple Roller Coaster which is an awesome sight to ride, see and hear. The complex is family friendly and the Hershey Chocolate World is a must that will bring the child in you back to life. The New York New York has recently updated many of their hotel rooms as well as the outdoor patio area. The décor in the casino area will not remind you of a back alley craps game but rather a speakeasy. The cuisine at New York New York is perfect for every budget and you might even think you are actually eating on the streets of New York. Overall, the New York New York is perfect when you are looking for that authentic East Coast feeling for the family. The décor at New York New York Hotel Las Vegas ranges from urban, to a Victorian look at times and the amenities are superb. The Park Avenue rooms are 350 square feet and the Madison Avenue rooms are slightly larger at 400 square feet. These standard size rooms do include a small sitting area, a work desk and a luxurious bathroom. The Spa suites have a huge spa tube in your room with separate bathroom facilities for a romantic feeling. The Marquis suites are slightly larger at 700 square feet and include an elaborate four person whirlpool tub that is partitioned off inside the suite. There is also a nice dining area that includes a mini refrigerator and an area to sit with comfortable chairs. The Players suites are 800 square feet and offer two queen sized beds situated in the corner with a wonderful sitting area that extends to include a dining room table. The Luxury one-bedroom suites at New York New York Hotel Las Vegas are very sleek and urban in décor at 1,100 square feet these include a nice living room area that also has a dining room table. The bedroom includes a work desk and an additional sitting area. The Penthouse suites have a wonderful heavy wood feeling with hardwood floors that cover a majority of the 1,100 plus square foot area. There is a sitting area adjacent to the wet bar and a living room with a full complement of furniture that is perfect for entertaining. The bedroom has a king size bed, an additional sitting area and a great bathroom with a separate spa tub for your enjoyment. Entertainment is not taken lightly at the New York New York Hotel Las Vegas. High quality comedians, musicians and interesting one-of-its-kind acts are regularly scheduled to perform. One of the more delightful and entertaining shows in Las Vegas is the Zumanity presented by Cirque DU Soleil. This high performance show is half burlesque and cabaret entertainment. You can also find entertainment during select times of the day at the famed replica of the Brooklyn Bridge. As a Big Apple icon the Brooklyn Bridge at New York New York will remind you of being in your favorite borough listening to world acclaimed artists singing on the street corners. The nightlife and bar scene is off the hook at New York New York Hotel Las Vegas with over nine themed bars and four of them are open 24-hours a day. Whether you are looking for a quick drink at the Lobby Bar or an interesting mixology of special tonics at the Center Bar or Pour 24, New York New York will satisfy your thirst. But the fun does not end just then. When you enter the Nine Fine Irishmen which is a lively Irish themed pub serving food and pints the good times begin to roll. The Bar at Times Square features dueling pianos in all of their battling glory to a standing room only audience. The signature cocktails that are poured at Coyote Ugly are second to none and this is a perfect for a bachelor or bachelorette party. The Chocolate Bar is ideal for starting or ending your evening with a wonderful Hershey Chocolate flavored drink laced with alcohol. 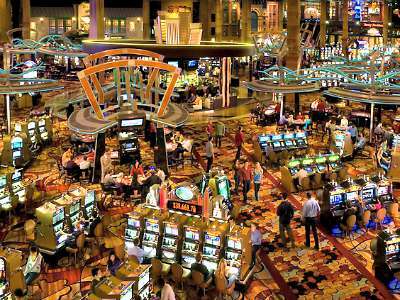 The casino at New York New York Hotel Las Vegas offers a variety of your favorite table games like poker and blackjack as well as numerous slot machines. The interior is filled with neon lights that bring to life the high energy that is created in this 80,000 plus square foot area that also portrays a typical East Coast neighborhood. The small 40 seat race and sports book is intimate but will remind you of being at a New York horse racing track and there is plenty of Yankee memorabilia to remind you of the past great who have the game. 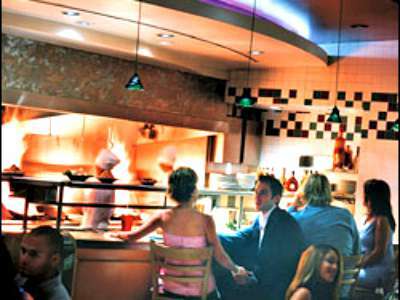 One of the best attributes of New York New York Hotel Las Vegas is their wide variety of excellent cuisine choices that range from street style to upscale to a signature steak cooked to perfection. Everyone in the family can be pleased with delicious food that fits within the budget. The street-style vending that is known throughout the Big Apple can be found in the Village Street Eateries. This must see food/street court of food is complete with décor that includes Brownstones and fire escapes like one would find on the East Coast. The restaurants are diversified and include such outstanding eateries as Nathan’s Hot Dogs, Ben and Jerry’s Ice Cream, Broadway Burger Bar and Sirrico’s Pizzeria. 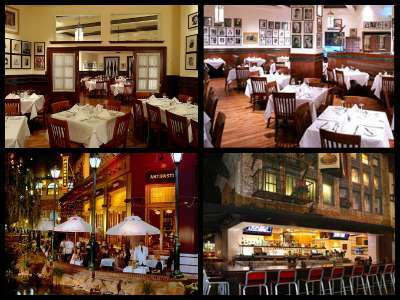 There are upscale options within the New York New York Hotel Las Vegas as well that include the fabulous burgers at the Shake Shack; a wonderful Italian feast at Il Fornaio; you can enjoy a great margarita and Mexican dishes at Gonzalez Y Gonzalez; Tom’s Urban has interesting upscale diner type cuisine; America is an exquisite place to enjoy a meal 24-hours a day; Chin Chin Café and Sushi is perfect for that Asian hunger crave; the Nine Fine Irishmen is the perfect place for authentic Irish food complete with Irish dancers and singers; if your taste buds are looking for a perfect steakhouse then look no further than to Gallagher’s Steakhouse for a great cut of pure heaven. There is only one pool at New York New York Hotel Las Vegas but it is quite large with a wonderful deck. There are also three hot tubs strategically located around the outer deck. You can reserve a cabana to help shield you from the sun or simply lay out your towel or grab a chair on the deck. Several packages are available that include food and beverage options. 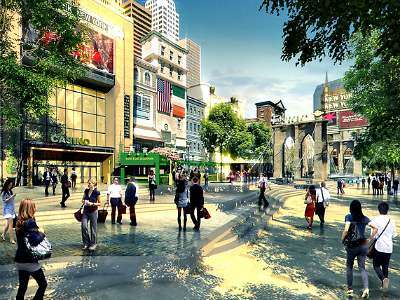 The Big Apple Coaster and Arcade is another family pleasing destination that has been all the rage since its inception. With a breath taking 180-degree maneuver that twists and dives in the form like a fighter jet your heart will be pumping. This amazing roller coaster will take you through a 67 m.p.h. experience that brings the true meaning to what negative G-force is all about. There is also the entertaining Big Apple Arcade that is also a great place to get your game on. With over a 100 different arcade style games, you can be assured that you will find a new or old time favorite game. Whether you prefer chasing zombies or building your own empire, you won’t be disappointed with the vast variety of old and newer interactive arcade games. 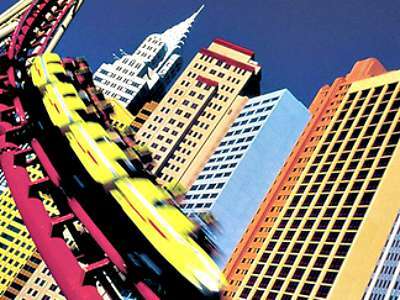 The Big Apple Coaster at New York New York Hotel Las Vegas is open daily from 11:00 A.M. until 11:00 P.M. with extended hours on the weekend and there is a 54 inch height restriction to ride this coaster. The Big Apple Arcade is open from 8:00 A.M. until Midnight daily and all ages are welcome in this family atmosphere. 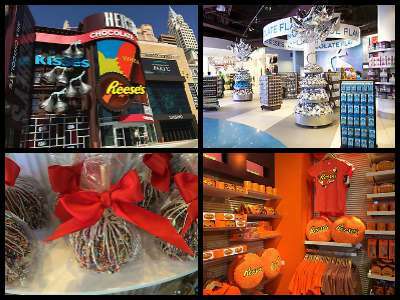 The Hershey’s Chocolate World at New York New York Hotel Las Vegas is a fabulous place to get your interactive sweet tooth satisfied. Imagine being Charley from the movie Willie Wonka and the Chocolate Factory; picking out your own mixture of peanut butter and chocolate or creating the perfect Hershey Kiss with your own personalized wrapper or just simply choosing one of the 800 different Hershey Chocolate products that are available. Situated in a two-story structure with over 13,000 square feet, the Hershey Chocolate World Las Vegas has an interesting mixture of interactive technology that brings chocolate to life. The West Coast flagship retail emporium even has an 800 pound Statue of Liberty and its very own Jolley Rancher Flavor Wall. This venue is open seven days a week from 9:00 A.M. until 11 P.M. and allows a person or family to remember just how much we love chocolate. The Spa at New York New York Hotel Las Vegas will please all of your tired senses and bring them back to a new energized level. Individuals and couples seeking the solitude of immersing themselves in meditation can choose from many different prearranged packages that mix and match your favorite experience. Whether your body is seeking hydration, solitude, stretching or just the kinks taken out, this spa will leave you ready for another great day or night in Sin City. The New York New York Hotel Las Vegas offers a multitude of shops specializing in New York fashion themes and souvenirs. Some of the more favorite shopping choices include Swatch, SoHo Village, Stupidiotic and the iconic I Love NYNY where you can find just about anything related to the Big Apple. There are a couple of unique places such as Houdini’s Magic Shop which is perfect for the magician in you; Coyote Ugly is an iconic bar but this is all retail; the Zumanity Boutique which offers memorabilia from several Cirque du Soleil shows and if you are looking for big bling then shopping at Grand Central Bling is a no brainer.